This recipe for Sichuan Pepper Chicken makes good use of left over honey and my favourite spice, star anise. Every time I make granola I have left over honey in the jar, and as it crystallizes I use the left over to make infused honey. I have been experimenting with flavours and I have added nuts to some, to make a great topping for breakfasts and desserts. When I was in Johannesburg last year I went to walk around Thrupps. This iconic shop has been in existence since 1892. My great Aunt called Thrupps every day for her delivery of groceries. After breakfast each morning she was given a list by her staff so she could order what was needed for the day’s meals – after her approval of course. My great Uncle insisted she run the household like a business, and she kept an old fashioned ledger of her income (house keeping allowance) and her expenditure. She would regale me with stories of how things changed from the 19th Century to ‘today’ the late 1990’s. She could tell me how much a loaf of bread cost her in 1948! But, I digress, as my Aunt has long since passed on, and Thrupps has moved and modernized. But, the quality and diversity is still the same – Stilton, whole crab and other delicacies abound, and amongst these I found some Sichuan Peppercorns. I brought them home and waited for a dish that was inspired by the ingredient. 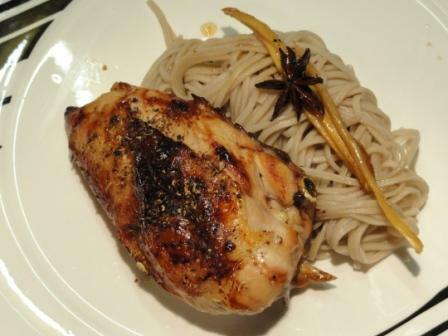 To this end, chicken breasts, star anise honey and the Sichuan peppercorns inspired a really tasty supper. I have not visited Thrupps since they relocated but do remember years ago getting lost in all the wonderful products on the shelves. Too delicious. Please let me know if there’s anything I can get for you from Thrupps before I come down in Feb.